That is what the US data for average state IQ and percent water fluoridation tells us. I thought I would check out the US IQ and fluoridation data for each state after reading Malin and Till (2015). That paper compared the prevalence of ADHD by state with the percent fluoridation in each state. There are problems with the paper (see ADHD linked to elevation not fluoridation and Poor peer-review – a case study) but what is good for the goose is good for the gander. How do the corresponding statistics for IQ compare? IQ data for US states are not readily available but I managed to find a data set of IQ estimates by state in 2000 based on Scholastic Aptitude Test scores. 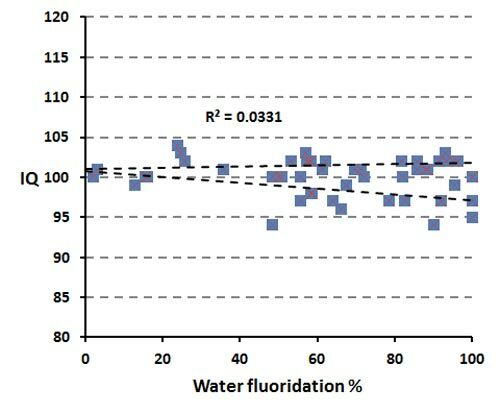 The correlation of these average IQ scores with water fluoridation (1992) is not at all significant statistically. The slope of the trend line in the plot below is not significantly different to zero (-0.04 to +0.01 at the 95% confidence level as represented by the dashed lines). This lack of correlation is not at all surprising. After all, the only published study to compare IQ and community water fluoridation (CWF) is that of Broadbent et al., (2014) – they also did not find any statistically signficant relationship. So what are the anti-fluoride propagandists on about? Very little was done in these studies to consider confounding factors. There is the possibility that inclusion of these confounding factors in correlations would show that fluoride does not make a statistically signficant contribution to IQ changes. Generally the authors have assumed a chemical toxicity explanation without any real justification. The data can be explained by other mechanisms such as the influence of the disfiguring effect of severe dental fluorosis on quality of life and learning (Perrott, 2015). In the few cases where data for severe dental fluorosis was included its relationship with IQ is statistically significant (eg Choi et al., 2015) (see Severe dental fluorosis the real cause of IQ deficits?). Severe dental fluorosis is not a problem in areas where CWF is used. There is no need to consider confounding factors for the correction in the above figure as CWF does not explain any of the variation in IQ. But I did find statistically significant relationship for IQ with a number of factors. The plots below show the data for premature births in 1990-1991 and average percent poverty in 2002-2004. These correlations by themselves explain 50 and 63% of the variation in IQ. Combined they explain 69% of the variation. The percentage of CWF in each state explains none of the variation. It would be more rational for those concerned about CWF to get active on issues related to poverty and premature births. The community water fluoridation issue is a dead duck as far as IQ is concerned. This entry was posted in Health and Medicine, SciBlogs, science, Science and Society and tagged fluoridation IQ, fluoride, SciBlogs, US. Bookmark the permalink. Ken – you may well be right. Then again you may well be wrong. I note that Malin and Till call for further studies into the relationship but of course that won’t happen lest something be found that confounds/compromises the fluoridationists position. The question I have regarding your hypothesis is do you have an obsession with poultry and what killed the duck? Here’s one for you Ken since you have done some fertiliser work. I am however just making it up, and don’t know if it actually happens, but hope the same thinking can be applied to your fluoridation study. Do fertilised pine trees grow better? So you try to find records of fertiliser used on pine forests. But do you take into account that the first crop of pine trees on cleared native bush grow well anyway and do not have fertiliser added? By the time for second or third crop the minerals of the soil are depleted and fertiliser is needed. So instead of whether fertiliser is applied you need to be looking at the mineral content of the soil, natural or added, and how growth of trees relates to that. Also look at pH correction, the addition of lime done with fluoridation, and optimum molybdenum. Also Ken, it is not fair just to talk about fluoridation from other points of view. WHO give a range of fluoride levels and a number of water supply engineers may be thinking some degree that is just the range of accuracy they are allowed, and giving choice for the people/council, too. They may not have noticed WHO’s intention to relate the level to a city’s air temperature. So what is “fluoridation” for a city depends on the understanding of the temperature variable by the locals. when Bluebottle asked Eccles the time and Eccles was able to tell Bluebottle because he had written it down on a piece of paper and kept it in his pocket. We have to have a sense of humour. All sorts of things that are drummed into us change. Such as modern relativity no longer considers mass to appear to increase relative to an observer dependent on its relative speed to the observer. Though *some* people are still saying it makes no difference if you explain it that way. I am not so sure. Brian – Ying tong yiddle I po! No Brian, I have never done any fertiliser work in the sense of working our nutrient requirements for anything, let alone pine trees. My only work with pine trees involved their effect on soils which had previously been in pasture and possible availability of nutrients like phosphate when returned to pasture. This involved consideration of soil microbes and microbial activity, breakdown of organic matter and release of organic phosphorus. It actually involved me recognising my working hypothesis was wrong and discovering a new hypothesis. One of those exhilarating examples of when scientists prove themselves wrong and are mature enough to accept it. Ken I heard of pines depleting soils. Maybe your nicroorganism thing is happening since in this trees seem to do ok even though soil phosphorus levels are depleted as shown by measurement. But the question is posed for more future crops. I am asking you to be taking into account that some of the non-fluoridated areas may have natural fluoride levels equal to or greater than fluoridated ones. Maybe you have the figures in front of you, the distribution of natural fluoride levels. It didn’t matter whether my claim was right or wrong or in between, it was just trying to say there may be more to the story than just fluoridated or not. Need to get multiple regression going. Note that the Dunedin study applied an IQ correction factor between rural and town, and you could do that, too, since larger towns are probably more likely to be fluoridated. And note that since you showed elevation played a role in ADHD, which can knock IQ measurement around, I would imagine, then you should allow for size of town/fluoridation related to elevation. And let’s please start to work with the tails of the distributions, respecting minorities. Soundhill, my point is that P levels are not depleted under pine – they actually increase due to relate from organic forms. Our work showed that couldn’t be explained by microbial and enzyme activities (they are actually higher under pasture). My new hypothesis was the physical breakdown of soil aggregates (and hence greater exposure of organic matter to microbial activity) and this is supported by empirical data. It is probably a common situation when pasture soils are cropped. You may have notice that give links to the sat I used so why don’t you go ahead and do your own analysis (of tails of distributions) instead of rambling on about them and sledging me to interpret you.